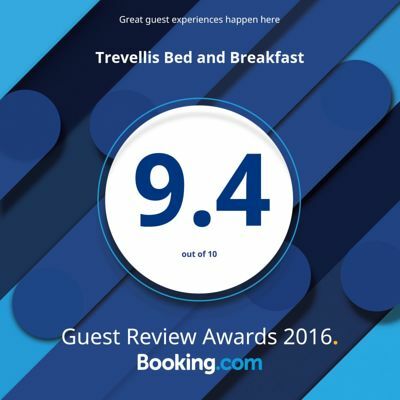 The Trevellis Bed and Breakfast in Newquay is situated in the heart of the town, close to the local beaches and the town centre. A warm welcome awaits you at the Trevellis Bed and Breakfast in Newquay. We are a small, family run guest house providing seven letting bedrooms in an excellent position – a short level walk to all amenities including shopping centre, night-life, beaches, harbour, coach, rail and bus stations. No hills to climb on your way home. We have a number of bedrooms, doubles/twins/family shower en-suites, singles (shared facilities). All our rooms are equipped with a free view television and complimentary refreshment tray. All rooms have recently been refurbished have central heating for the colder winter, towels are provided, hair dryers and ironing facilities available on request. Guests are provided with their own keys and have access at all times. Free WIFI is available . Single bed room with shared shower/toilet facilities. Small Double bedroom Toilet/shower en-suite. Twin or Double bedroom Toilet/shower en-suite. The dining room is spacious with separate tables where a full English breakfast is served. Various options/vegetarian available on request.